Register by Monday, Aug. 27, 2018, to take advantage of early registration discounts. ObesityWeek registration takes less than 10 minutes. Register today! Book Your Room to Receive Our Group Rate! Register for ObesityWeek and then book your hotel room as soon as possible. In order to receive the group rate, you MUST register and use the link provided in your registration confirmation email. Rooms are on a first-come, first-served basis. Due to unprecedented attendance for ObesityWeek 2018 and two large Nashville events, hotel rooms are extremely limited. We are working to accommodate all of our attendees’ needs. Click here for the most up-to-date information. Why Take TOS Review Course at ObesityWeek? A preconference event at ObesityWeek Sunday, Nov. 11-Monday, Nov. 12, 2018. TOS Review Course follows the ABOM rubric, giving you the most concise and yet sufficiently detailed material to enhance your knowledge of exam questions. Learn from leading obesity educators and practice board-exam style questions with answers, and receive a workbook of slides to take home for future study. Earn all 30 required Group One Credits by attending both the Review Course and ObesityWeek. Stay for scientific sessions at ObesityWeek and continue your preparation by following the Obesity Medicine Exam Prep Track! 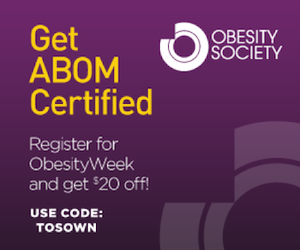 Save $20 on ObesityWeek Registration by using code TOSOWN. This is your LAST CHANCE to earn Group One Credits before the Feb. 25-28, 2019, ABOM exam. Do you make your colleagues laugh? Do you know someone who does? Smart people often have a killer sense of humor, and let’s face it—members of TOS are brilliant. 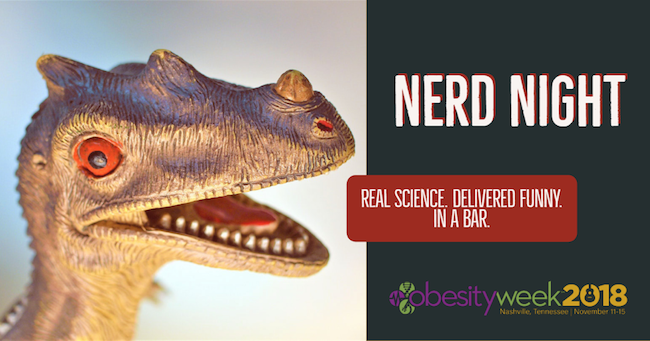 TOS is hosting a Nerd Night at ObesityWeek. We are looking for members who can deliver real science in a funny presentation. Nerd Nights are becoming an institution at campuses all over the world. We are having ours at a hip new bar on Honky Tonk row on Tuesday, Nov. 13, 2018, in Nashville. Nominate yourself or a colleague to present by sending an email to annualmeeting@obesity.org. Steven Nissen, MD, is Chairman of the Department of Cardiovascular Medicine at the Cleveland Clinic and Professor of Medicine at the Cleveland Clinic Lerner College of Medicine at Case Western Reserve University in Cleveland, Ohio. Learn more about Dr. Nissen and other keynote speakers featured at ObesityWeek. Excited about ObesityWeek? Follow us on Facebook and Twitter. Then, tell us what you enjoyed about the conference. Use the hashtag #OW2018 to be featured on ObesityWeek's official Twitter account. Launching and maintaining support groups can be challenging for all healthcare professionals involved. ObesityWeek offers multiple opportunities for you to attend support group sessions such as Support Group Professional Networking Group, Support Group pre-conference course, and Support Group-IH Roundtable Lunch.